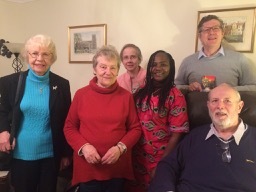 Many new people committed to supporting Grace & Light in prayer as international coordinator Tassie Ghata toured the UK visiting churches, charities and long-standing friends. 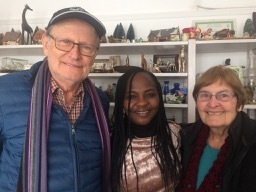 “We have expanded our horizons with many new people hearing about our work in Nigeria, asking lots of questions and signing up to receive information about what we are doing,” said Tassie. 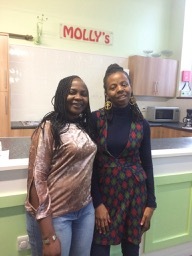 Our first visit was to Zion Baptist Church in Cambridge. 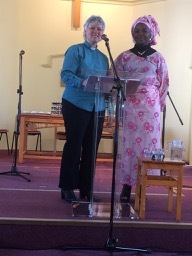 This was followed by a UK trustees meeting in Upper Norwood, Sunday service at Perry Rise Baptist Church in Forest Hill, African evening hosted jointly by Elim and River of Life churches in Worthing, prayer meeting and Sunday service with Holme-on-Spalding Moor Christian Fellowship, meeting and lunch at St Augustine’s, Hedon near Hull, Elim Filippino church in York, Holme-on-Spalding Moor Primary School assembly, and two prayer groups in Sheffield. 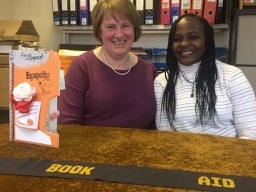 We also met with Christine Pulsford at Book Aid in Sydenham, George Verwer of OM Special Projects, and Femi Ladega, Julaine Hedman and Les Issacs at Ascension Trust in Morden. Les is guest speaker at our leaders’ conference in September. 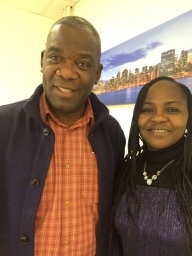 International coordinator Tassie Ghata spent two and a half weeks in the UK from 20 March to 5 April. Tassie Ghata with George and Drena Verwer.